The interest rate is the rate at which the money is borrowed. Many of us think that the interest cost is greatest, but there are some implied costs included in the cost of borrowing which we don’t notice. On the other extreme, APR or Annual Percentage Rate is an example of such cost, that is described as the overall borrowing cost. Nowadays, loan and mortgage are considered as one of the best means to fulfil the monetary requirement of businesses and individuals, for which they need to pay a percentage of the loan to the financial intermediary at periodic intervals. 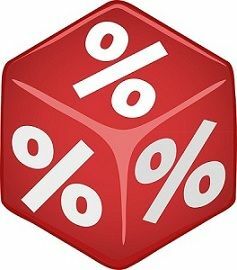 Here, in this article, we are going to discuss the important points of differences between interest rate and APR, have a look. Meaning The rate at which interest is charged by the lenders on the loan given to the borrowers is known as interest rate. Annual Percentage Rate or APR is the total cost of borrowing, expressed as an annual rate. What is it? Fee charged on borrowed capital. Effective rate used to make comparison between different loans. By the term interest rate, we mean a rate charged by the lender on the asset lent for use, to the borrower, for a particular length of time. It is a borrowing cost, which is expressed as a defined percentage of the principal amount. The asset borrowed can be cash, fixed asset or current asset. It is paid as a fixed percentage of principal, at regular intervals, during the lifetime of the debt. The rate of interest varies from lender to lender and also different interest rates, apply to different loan types, offered by the same lender. It is exclusive of fees and other charges, which are paid by the borrower while taking the loan. In a nutshell, the interest rate is a fee charged by the banks or other financial institution; that compensates for sacrificing other investment opportunities, which has been taken, with the amount given as a loan. APR or Annual Percentage Rate is the interest amount on the total debt, which is paid by the borrower yearly. It takes into account all the fees, charges, additional cost such as mortgage fee on a credit card, settlement fees, origination fees, prepaid interest, closing fees, mortgage insurance premium, etc. associated with the transaction charged by the lender, that the borrower has to pay on mortgages, loans, credit cards and so on. To put simply, APR means, what will be the cost of borrowing, for an average year, over the lifetime of the loan. It is considered as an effective tool, for comparing various financial products, rather than using an interest rate. It is a true indicator of the real cost of the loan, where lower APR signals lower monthly payments while higher APR represents higher monthly instalments. The interest rate is described as the rate at which interest is charged by the lenders on the loan given to the borrowers. APR or Annual Percentage Rate is the per year total cost of borrowing. Interest Rate is nothing but a fee charged on the borrowed sum of money. On the other hand, APR is an effective rate used to make the comparison between different loans. In general, APR is greater than Interest rate. The transaction cost is not included in interest rates. Conversely, in the case of APR, the transaction cost is included, i.e. mortgage insurance premium, administrative fees, discount points, settlement fees and so on. The price at which the money can be borrowed, is the interest rate, whereas APR, reflects the actual annual cost of borrowing funds. The basic difference between these two is that, while interest rate shows current borrowing cost, APR is used to present the true picture of total cost of financing, where the interest rate and the lender fees needed to finance the loan are taken into consideration.